That being the case, I suppose I am more of a geek. I embrace my geekness, though I can honestly say that I have never been a comic book geek in the true sense of the word. While I have read a few graphic novels, I’ve never collected issues and kept them hermetically sealed in a temperature controlled room. Nevertheless, I’ve had a lifelong admiration for the character of Superman (as the shield in the header of this blog attests). I have also been watching the NBC show Heroes since it begain airing in the fall of 2006 (speaking of Superman, it helped me to recover from “Superman Returns,” which I felt was very untrue to the idea of the character). I am also a bit of a marketing geek, so I tend to notice things most other won’t — especially when my two areas of interest collide, as they have recently in Heroes. Over the past few seasons of the show, there has been some clumsily obvious product placements. While not entirely distracting from the show, they are hard to miss. The two main brands that have maintained a strong presence in the show are Nissan and Sprint. It will be interesting to see how the upheaval in the economy and automobile industry might affect this ongoing relationship. Sprint has become heavily involved as of late, even sponsoring an online contest that invited viewers to chose a new hero for an online webisode. I am also a customer of Sprint and have been since January 2000. In May 2008 I upgraded to the Palm Centro and have been using it ever since (I still am likely only using 25% of the phone’s capabilities). One of the features I occasionally use is the Internet access — though I would use it more if it were not for inconsistent connection speeds and an underwhelming interface (it does not display the “real” Internet as is the case with the iPhone). 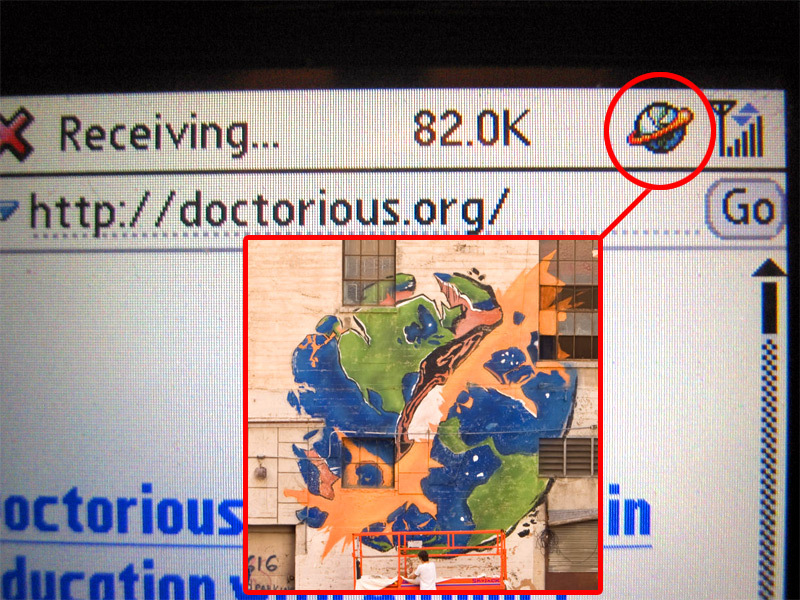 In any case, something caught my eye one day when I was browsing the “fake” Internet on my Palm Centro: the connection/activity icon on the phone is almost identical to the thematic image from Season 3 of Heroes! This image is one that depicts the earth spliting apart along a diagonal line (bottom left to top right). The connection/activity icon on the Palm Centro depicts an earth with some kind of flame or ball of energy transversing it in a diagonal line (bottom left to top right). Unique Sprint Product Placement in NBC’s Heroes? I would love to get some other opinions on this. Certainly this is not the Rosetta stone or anything, but it does intrigue me. By the way, for a more complete list of product placement in Heroes episodes and other information about the show, check out the Heroes Wiki. On January 2, 2009 at 12:42 AM I posted the following question on Twitter: @greggrunberg @dhlawrencexvii @breagrant, is Sprint subliminally “celling” on “Heroes?” www.tr.im/sprint. A short time later, at 1:29 AM, I noticed David Lawrence had just posted a tweet. So I resent the same question directly to him: @dhlawrencexvii Is Sprint subliminally “celling” on “Heroes?” Read this if you get a chance: www.tr.im/sprint. @Joseph_Yi and I are curious. A few minutes later, on January 2, 2009 at 1:42 AM, David Lawrence replied as follows: @doctorious Sprint (and Nissan) are Heroes’ 3 biggest advertisers. Nothing subliminal about it. All of us use Sprint cell phones on the show. Later that same day, January 2, 2009 at 12:13 PM, Brea Grant sent a reply as well: @doctorious nothing subliminal about sponsorship on the show but i think the whole world splitting thing is just a coincidence. I never heard back from Greg Grunberg, but I appreciate the two responses I did receive as they were interesting and enlightening. I wonder how someone who works in production for the show might answer for my question? In the spirit of the holiday season, I crafted the following economy-inspired version of the classic Christmas tradition ‘Twas the Night Before Christmas for your yuletide pleasure. Behold a brand-new holiday classic: ‘Twas The Night Before Bailout! Directors were scrambling, cash and stock options to horde. Everyone hoping that St. Paulson would soon be ringing. While visions of cash bonuses danced about like flies. Just cooked our books so Fed money we could trap. I sprang from my office, did the glass ceiling shatter? Tore open the blinds, with anticipation I was dizzy. Gave the lustre of Bond’s martinis to objects like neon. But a red Hummer burning rubber across the night sky! I knew in a moment that St. Paulson was finally here! On, GM! On, Chrysler! On Goldman and Fannie! To the top of the building! To the top of Street Wall! With bags full of TARP money and St. Paulson too. The posturing and grandstanding of all eight underlings. Right into the Boardroom St. Paulson crashed down. And his clothes were tarnished with the money he robbed. He looked like a meth dealer furtively opening his pack. His eyes how they squinted! His breath was so smelly! His face covered in cash, dirty dollars filled his belly! So slick was his style, his beard covered in grease. His carbon footprint was huge, it went for miles I saw! It sloshed when he laughed, like a bowlful of crude oil! Had he not had the cash I’dve hit him with my roadster! Sarbanes-Oxley is a joke, now of regulations I am free! And filled all of the Board’s pockets with the stolen green. And when giving a belch, up through the ceiling he rose! And away they all flew, but long did his stench still linger. World-renowned evangelist, author, and speaker Guy Kawasaki was a guest on the radio show “Coast to Coast AM” during the December 20 to December 21, 2008 broadcast. He was promoting his book “Reality Check” and to discuss idea creation. @guykawasaki I dare you to say "cheeky monkey." I have often wondered why some ideas catch fire and others don’t — especially when a superior idea fails commercially. I was especially intrigued by his comments about luck. “I’d rather be lucky than smart. Specifically, the quote below about successful individuals not accounting for luck as a component to their success struck a chord. @guykawasaki Book Idea: "Luck!" Interview 10 successful CEOs and identify their "luck" &10 unsuccessful ones and identify their "unluck." I immediately received positive feedback about my idea from @NEENZ, @robynmcintyre, and @Bytemarks. @doctorious I'm with @NEEZ – write the damn book ; neither luck or Guy can help if you haven't got product. @NEENZ Keep us posted of @doctorious plans. We could make it happen. Although the idea was still crystallizing in my mind, I joked the book could be called the “Guy Luck Club” (as spoof of the “Joy Luck Club” book). I considered creating a blog specifically about this topic; my idea was to use it as a conduit through which I could communicate and refine my raw thoughts while giving the book marketing exposure. Incidentally, David Meerman Scott did just that when writing his book “The New Rules of Marketing and PR.” I actually received a direct message from Mr. Scott on Twitter (@dmscott) in which he encouraged me to write the book first as a blog (without any pretense for organization) and approach publishers in a year. Great advice — especially since it was the path he took to get his book published! I imagine it could be most effective to test Guy’s theory, by first identifying ten CEO’s of a startup (that is not a spin off of an established company). I would take a standardized inventory of each CEO, paying particular attention to their thoughts about luck. I will reconnect with them at regular intervals: 1, 3, and 5 years (enough time for the business to have succeeded or failed). I will re-asses their thoughts on luck and see if their views have changed when asked the same question over time. In thinking about the past 14 hours since this experience began, I couldn’t have scripted a better example of the power of social media; I am energized about writing this book! Thank you to everyone who shared their enthusiasm and encouragement. Maybe I can convince Guy Kawasaki to write the forward for my book? Holy Kaw!